Success Principles: Keep It Simple, Go To The "Bank Shot" - Motivate Amaze Be GREAT: The Motivation and Inspiration for Self-Improvement you need! Home Motivation new Success Principles: Keep It Simple, Go To The "Bank Shot"
Success Principles: Keep It Simple, Go To The "Bank Shot"
Fact: When ordinary people, like you and me, talk about working hard in order to achieve amazing things they get discouraged. Mainly because we hate the word hard, not because we hate the amazing things. In fact, we love them! But, sometimes we are not willing to sacrifice for them, we see hard work as too hard, a thing that requires a lot of discipline, and we simply don't want to do it. D. I want to be a singer, but making instrumentals for me to sing it's a really hard task that I don't have the time to do. I know you're thinking...you need to change, and your mind is wrong you need to correct it, but you were born that way, you need extensive therapy and bla bla bla... NO! That's not it! Perhaps you already have at your disposal the resources you need to achieve what you want. You are just elaborating to much, you are making things more difficult than what they really are. A basketball player has the ball in his hands near the basket at 45 degrees position from the backboard, and the defensive player it's all on him. Does he go for the difficult lob shot, a shot that has to have the perfect vertical/horizontal trajectory to pass over the defender and into the 3 inch from the ground basketball goal? No! That's know as a "bad shot selection", because it has a very low field goal percentage. Instead, what he does it's to simplify things and go for the easier Bank Shot. A shot that doesn't need to go over the defender or to have a difficult execution. He goes for a shot that rebounds off the backboard straight into the basket. It's a Bank Shot, and that's money! Did he get the results he wanted? Yes! Did he had to work hard for it? No! He simplified things and got the result he wanted. That's what you need to do! You need to find your Bank Shot, because...that's money! Stop looking at the hard shot you can't perform or won't do because its to difficult. You need to find a simple way to achieve what you want, stop looking for the hard road that you can't follow or won't follow because its to hard. Keeping it simple its a matter of perspective, you need to exploit situations from different angles, to the point you find the right angle, the angle that works. Like the basketball player exploits the shots he has at his display and chooses the 45 angle degree from the goal shot, the Bank Shot, the shot the gives him the highest percentage of field goals, the shot that's money! - Choose an exercise activity that you do like to do, or enjoy doing, in no time you'll be wanting to do it more and more, the weight will come down, and that's money! - Cut down on unnecessary expenses you have, and that's money, real money. - Redecorate your old house, paint the walls in a new way, bring a new feeling to it, that's money! - Go to Youtube or some other source and use the free instrumentals to perfect your singing skills, that's money! Whatever your case may be, keep things simple, it will work if you change the perspective and find the precise angle. 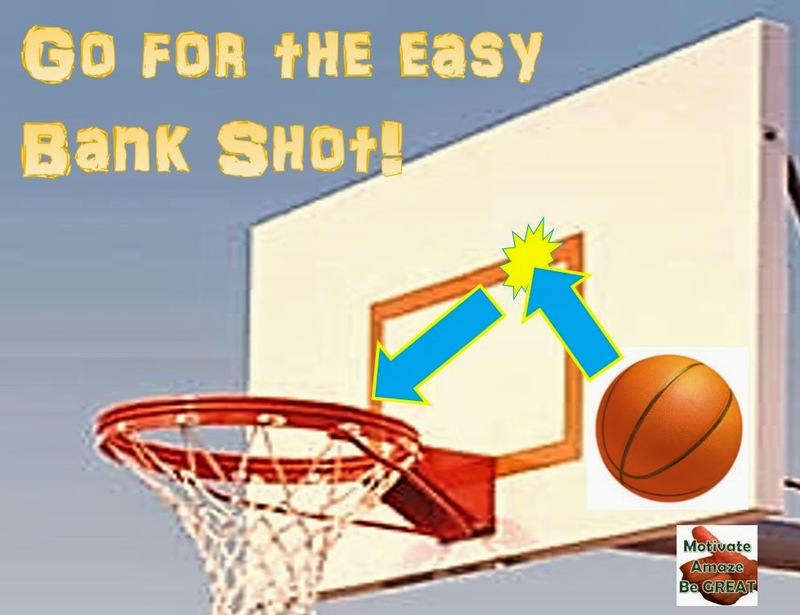 Look for the Bank Shot and it will be money to achieve the amazing things you want!